Iryna Lapshyna has a Phd in International Economics. She is a lecturer at the Ukrainian Catholic University (Lviv) and at research associate at South East European Studies at the University of Oxford. 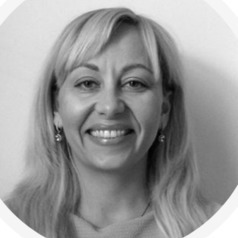 Previously, Iryna was a Senior Researcher at COMPAS, University of Oxford where she worked on the project ‘Does immigration enforcement matter? Irregular immigrants and control policies in the UK’ funded by the ESRC (2016-2017). She was also a grant holder of the British Academy and completed a project on the Ukrainian Diaspora in the UK and Poland (“Do Diasporas matter? Exploring the potential role of Diaspora in the reform and post-conflict reconstruction of Ukraine”, 2015-2016). 2014, she was Associate Professor at Lviv Academy of Commerce, Ukraine. Her research focuses on labour migration, irregular migration, individual perceptions and aspirations, diaspora, corruption and human capital development.